With this complete Top of the Line Kit, you will be receiving over 21 Quarts of sprayable material!! Acrylic Urethane Universal Clearcoat: This 4.2 VOC universal clearcoat provides excellent flow, leveling, rich gloss, good durability, and chemical resistance, acrylic urethane clear offers excellent UV protection and has great next day buffability. 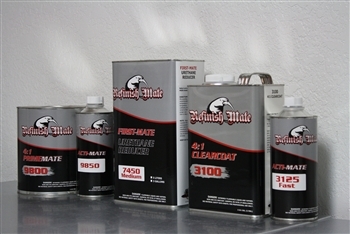 Our range of hardeners has been specifically designed to suit all conditions, using most Refinish Mate product. MS and normal hardeners are available. The range features the following hardener speeds: Ultra Fast, Fast, Medium and Slow for all possible applications.